The Mule_ (Type-6 Transporter) was cheap small freighter able do its jobs reliably, but she was also quite fragile how have Karina learned first hand when was doing a job for the SJC faction as a courier delivering strategical messages. This type of job was easy going and safe under normal circumstances, but some circumstances may be out of control of the employer. This time someone has decided to interrupt message delivery, and he also ordered skilled assassin with a strong ship. 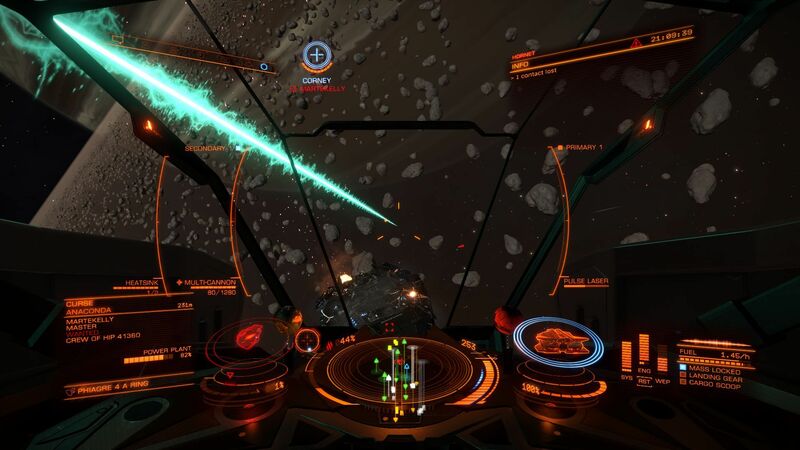 It happened in system Gilyadar where heavily armed Python, piloted by a Neil Beasant, pulled a small T6 freighter from supercruise (SC) and then destroyed her without any warning. Karina had to spent few following hours in escape capsule than was rescued by independent pilot, but luckily for her she had there also an emergency backup of all messages from the ship computer. Data were transferred into neural net of the new ship (paid by the insurance company) and Karina continued to original destination. However previous attacker was again waiting in the destination system!, but the outcome of encounter was this time different. The main difference was that Karina was not as much surprised, and she expected an attack when saw on radar a ship following her. During following attack, when shield of Mule collapsed, she immediately activated the silent mode, fired chaff and used very chaotic flight pattern till attacker stayed far behind. Escape was successfull, but _Mule's hull integrity was reduced below 50% ... "Enough is enough! ", she thought in anger after succesfull landing, "I need some combat ship which can give a punch and survive at the same time!" Karina used her exploration ship Bubo (Diamondback Explorer) to quickly reach nearest LYR exploited system Hamal and visited there shipyard on the Coriolis type station named Hermaszewski Dock. The seller was an old veteran which shortly looked at Karina and quietly told her: "Buy a vulture, then go visit Felicity Farseer and ask her for a "overcharghed" upgrade of powerplant in a special arrangement called "monstered". You can thank me later ...". After that he went away, and stunned Karina was staying alone at shipyard's shopping terminal. Karina have studied ships and theirs technical details during most of her time at the University, and therefore she did not needed too much time for discover that weak powerplant is just only one obvious weakness of the vulture. Karina has proceed with shoping, equipped her new ship by the best available equipment; then she checked energy priorities and disabled the energy input for all weapons and left only part of the defensive modules powered ... "all this stuff will be back on-line after tunning of the powerplant at Felicity workshop", she thought. Then she asked for permission to take-off, and gently pulled her Hornet out of the landing pad ... ship handling was looking really well and she enjoyed the "boost" while was leaving the station through the mailslot. "Flying in this ship will be a blast! ", she thought enthusiastically when plotting the course to the Deciat system (home of Felicity Farseer). Vulture named the "Hornet" was at first carefully tested in safe environment of the local Nav-Beacon and also in nearby asteroid ring with the support of the local authority forces and hired wingman. Then was ship upgraded by three basic engineers (Felicity, Elvira, and McQeen) and final combat test was done few days later in the hazardous resources extraction site (Haz-RES), in the Phiagre system. Karina was carefully scanning all ships appearing there, till she found lonely pirate with a bounty and attacked him. First real fight was not going easily at all, mainly due Karina's inexperience with ships controls used under pressure, but in the end the pirate vessel have exploded. Karina was realy tired but she felt strong satisfaction ... she is no longer just a weak target which can only flee from fight; now she can fight back if this will be needed! After fight Karina have scanned the surrounding area and found numerous canisters marked as illegal cargo; all obviously were falling out from damaged cargo-hatch on the pirate vessel during the fight. Two of them were slowly and carefully tractored into small cargo_container installed into the Hornet. Karina wanted to deliver this illegal cargo to two different black markets; the reason for this were the informations about Engineer called the "Dweller", which was known for his support to the smugglers. For get an invite from him, and opening access to his specialised workshop (upgrades to power distributors and lasers weapons), was requested use of at least five different black-markets. Engineer Tod McQeen already proved to Karina that large multicanon with his upgrades is really deadly weapon; she now wanted similar improvement for large pulse laser installed as second weapon on the Hornet. With full access to the Dweller had Karina now opened services of four engineers which were able to do upgrades to most of ship modules, and this supported the ability to succesfully perform more different tasks. With three hundreds of milions dolars were also opened possibilities for new ships purchases, but Karina decided to chose just only one new ship which however must allow her to do new things. One from these new activities was the mining ... She never tried to do it, but she already heard that it has need of more ship's internal modules for special mining equipment. The best candidate seemed mid-size Python, then T7 and then large Anaconda. But all these ships were either slow, too big and except T7 also very costly. Another option was Imperial Clipper which however requested to have higher imperial rank, and which had also suboptimal sizes of internal modules. 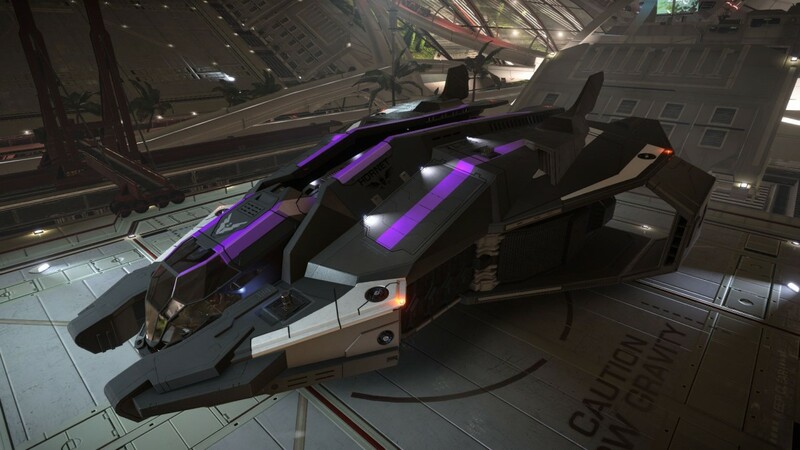 The last choice was ship, which appeared on the markets only recently, called Krait Mk II. 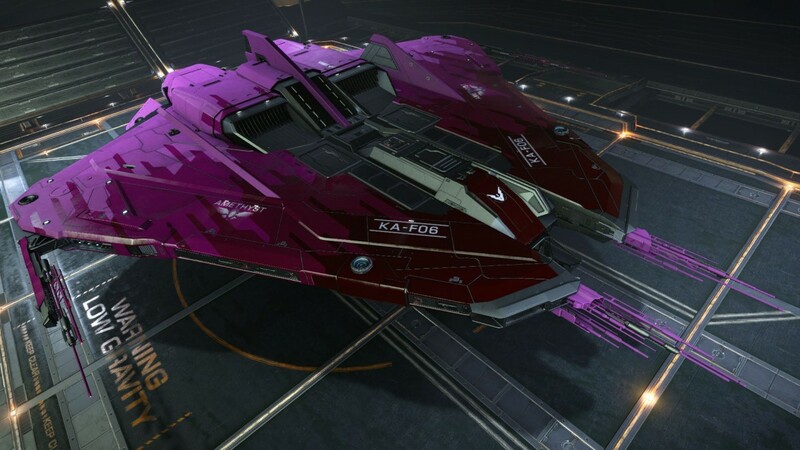 Karina spent longer time with studying of all available Krait's technical blueprints, and then she decided to give this ship a chance to prove its abilities in real. Karina again visited LYR space and soon she were proud owner of the "Amethyst". It was not small ship, handling was much tougher when compared with Hornet, but power hidden in thrusters of this ship, huge energy output from powerplant and amazing convergence of the weapons hardpoints were telling that this ship might be really good. The ability to use hangar with SLFs (ship launched fighters) was the proverbial cherry on the cake. Karina accepted few mining operations and searched through her databases for nearest system with pristine mineral reserves. System Bhare seemed was the best candidate, it had not only planets with mettalic rings, but there were also ice rings which together were source of all known mined materials. In Bhare were also except one big station two smaller outposts, which one had all necessary services for support mining operations. Mining itself was going well, thrusters of the Amethyst offered good acceleration for quick asteroids prospecting and Karina has slowly learned how to do mining the most effective way. Karina returned to Bhare few times, and during travels there and back she started search for more knowledge about the mining. She learned how to use filters installed on collector controllers which were now able ignore chosen materials; she learned also how to position her ship close to mined asteroids to increase the speed of collecting mined materials. She also found information about special weapon which had weaker extraction power but was able extract the ore from asteroids distant 2 km. Name of this weapon was Mining Lance and it was given as a reward to commanders which pledged to Zemina Torval which is one from high figures in the Imperium. "It will need few weeks to reach this weapon", thought Karina, "but I want it!" Later of the same day Karina pledged to Zemina Torval and accepted the risk of potencial hostile encounters with pilots serving under federation flag. It was at the end of one mining session when ship computer announced incoming private message. There was hidden sender, but Karina knew well who is it; in the message was just short text: "Enjoy pledge to the Torval! , Karina. I'm now returning from small exploration trip with load of special micromaterials acquired at old ruins of civilisation called Guardians. We need meet soon, I have important information for you ..."